The offshore industry operates under extreme conditions, therefore cables and cable accessories must demonstrate advanced technical specification performance. Endurance and reliability cannot be compromised. Under-specified or sub-standard electrical equipment and cable accessories can pose serious threat to the safety of people and plant. Silver Fox "Fox-Flo" Tie-On cable labels are tested to International Maritime Organisation (IMO) standards for labelling power, control, instrumentation and signal cables for use in the offshore oil and gas, shipbuilding and marine industries. The tests include the ISO 5659-2, Part 2 "Smoke & Toxicity" test and the IMO Fire Test Procedure Code Part 5 Appendix 1 : "Fire test procedures for surface flammability of bulkhead, ceiling, deck finish materials and primary deck coverings". Other cable labelling applications include : communication, LAN, bus, CCTV camera, coaxial cables. Acidic smoke and gas emissions inflict corrosion damage to all types of substrates - the heat generated by fire opens the substrate pores and drives soot particles deeply into outer layers of the substrates of electrical equipment or cables. Soot when combined with water or high humidity conditions exponentially increases the acidic strength and exacerbates aggressive damage to equipment. Smoke damage to electronic equipment can be significantly more extensive than the actual fire. Electronic, electrical and cabling equipment can occasionally be repaired for re-use. Electrical gear, power distribution and generation equipment should only be serviced by properly trained electrical engineers using correct tools, testing and recertification methods for working with OEM consent and approvals prior to being put back into use or re-commissioning. Flame Test : Low Smoke & Fume v Low Smoke Zero Halogen. There Is A Difference. LSF cable emits black smoke containing toxic and corrosive gases which pose choking dangers to personnel and catastrophic damage to sensitive electronic equipment in fire situations. Toxic smoke generated by combustion would cause serious disruption and safety risks where poisonous gas accumulates in poorly ventilated areas. Silver Fox "Fox-Flo" Cable Labels Are Low Smoke, Zero Halogen. Silver Fox Tie-on Cable Labels are ideal for larger cables and cable bundles and for use with nylon or stainless steel cable ties. 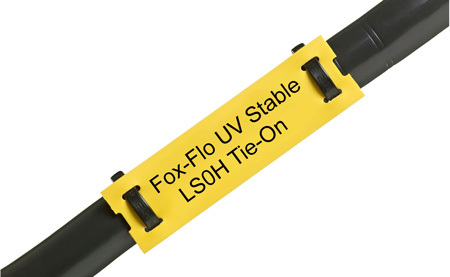 Silver Fox "Fox-Flo" Tie-on cable labels are low-smoke, zero-halogen and UV-stable. Produced using the highest quality materials offering long-term endurance and reliability of zero halogen cable labels. The Silver Fox "Fox-Flo" labels are both strong and flexible and can be attached using either nylon or stainless steel cable ties. Print quickly and easily using the Silver Fox Plug'N'Play thermal printer and Silver Fox Labacus Innovator Advanced or Professional labelling software. T&D are distributors for Silver Fox the market leading manufacturer of Cable Labels and Marking Systems - fast and efficient identification of cables, wires, optical fibres, panels, valves and equipment in safe and hazardous areas. Silver Fox cable labels comprise Laser, Tie-On and Thermal Heat Shrink solutions for utilities, telecoms, power, construction, rail, mining, subsea, offshore, oil, gas and petrochemical industries. Silver Fox cable labels are manufactured for long-term performance, endurance and reliability Turning Time Into Profit. 60 Labels in 15 Seconds. YouTube Video : North Sea Oil & Gas Installations are subjected to extreme electrical and mechanical conditions. Silver Fox Cable Labels are designed, manufactured and tested to highest level of material performance and technical specification. Specify & Buy Silver Fox Labels for offshore cable label projects.